While we’ve made it past some of the colder seasons of the year, we haven’t had all that many cold days. We all know that this means that our spring is sure to be cold and wet. Since temperatures are sure to get a little bit cooler in the next couple of weeks, one of the things that you can anticipate is certain pests making their way indoors and hiding out. The warmth of your home is exactly what they need to get it through the cold days. If you want to stay on top of any pests that might make their way into your home, keep reading. Today’s blog is going to cover some of the pests that are sure to head towards the house when temperatures drop. Rodents are one of the pests that can survive regardless of the time of the year or the temperatures outdoors. While they’re a pest that you mainly have to worry about when you have food out in the open or an open space close to your house, you are going to have to be more aware of rodents in your house when temperatures drop, and they start to need some extra warmth. Because rodents are small in size, it’s easy for them to make their way into garages, sheds, and homes relatively easy. If there are any cracks or openings that they can squeeze through, you can guarantee that they’re going to take their chances and try to make it their new home. If you don’t stay on top of any evidence of rodents in your home, you can quickly wind up with an infestation. Pro Tip: We primarily focus on pests in the home, but that’s not the only place that you should be cautious of rodents in. One of the places you should keep an eye on as temperatures drop is your car. It’s easy for mice to work their way into the engine of your car, but once they’ve found their way in there, it’s even easier for them to make their way inside of your car. Glove Box compartments are especially popular for mice to call home. Another pest that you see year round are spiders. These pests love being able to build their webs in places where they won’t be disturbed. 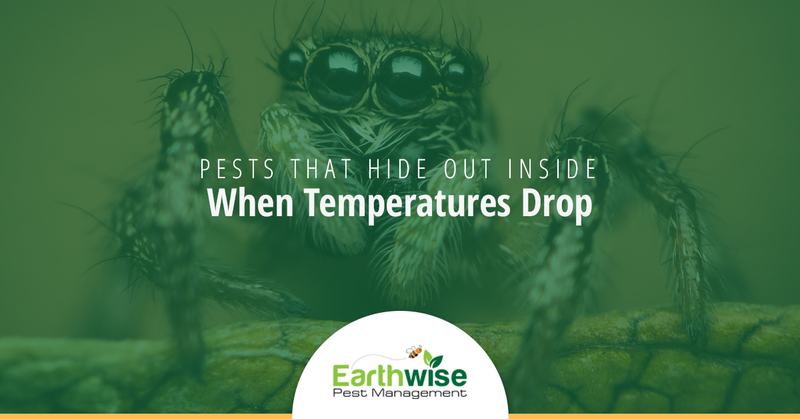 Unfortunately, when temperatures start to drop it becomes challenging for spiders to stay alive outdoors. For that reason, they start to make their way indoors and seek out dark corners where their webs are likely to go unnoticed. Though a few spiders aren’t going to do much harm in your home, they can eventually become a problem. In fact, the longer that you let spiders take up residence in your home, the bigger problem you’re going to have on your hands. Pro Tip: Routine treatment for spiders is a great way to ensure that they don’t become a problem, regardless of the time of year. Depending on the spiders that you’re seeing drawn to your home, there could be certain factors that we tackle to keep them from returning time and time again. One of the worst pests that you can find in your house, in the opinion of many, is a cockroach. There’s something about cockroaches that the sight of them alone makes finding them all the worse. Usually, people assume that cockroaches go to a home because it is dirty. Though that can play a role in whether or not a cockroach goes unnoticed, it’s not necessarily the reason that a cockroach goes into a home. Cockroaches are one of the most common pests found in homes, especially in the Sacramento area. When temperatures get colder, they start to work their way into homes in search of a warm place to call home. The thing about cockroaches is that they love dark, moist areas in a house where they can go unnoticed for longer periods of time. The downside of this is that there are plenty of areas in our homes that offer these types of conditions for cockroaches to come across. Pro Tip: Given that dark, moist spaces are areas that cockroaches like to hideout, you want to make sure that you stay on top of checking them so that you can stumble upon cockroach infestations sooner than later. On top of that, you want to make sure to resolve any leaks that leave standing water as quickly as possible. There are quite a few pests that will work on finding warmer spaces to call home when temperatures drop. Though we’ve covered three of the most common pests that you should look out for, they certainly aren’t the only ones. Ideally, you should keep an eye out for any and all pests that you find in your home. In the case that you notice more pests than you’re accustomed to, reach out to your local home pest control company so that they can assist you. If you find yourself with a pest problem this spring, contact Earthwise Pest Management. Our team is here to provide the Sacramento area with the quality pest control services that they’re in need of. Whether it’s a pest problem that’s arrived in the weeks where temperatures dropped, or it’s an infestation that you were entirely unaware of, we can help. Schedule your free consultation with our team, and we’ll walk you through the pest management method that we provide. When you work with us, you can count on efficient and safe solutions.